Naomi Dove Henderson's sister, Sivilla Henderson Jones, wrote a sketch of the lives of her parents, James Wesley Henderson and Annie Caroline Smith Henderson. A few years before the beginning of the Civil War, my father, James Wesley Henderson was born, August 4, 1848, near Jackson, Madison County, Tennessee. He was the youngest of the three children of Hugh Carnes Henderson and his second wife Lucretia L. Taylor Henderson. He had several half brothers and sisters by his father's first and third marriages. James's mother died when he was two years old. His half sister, Caroline, Tiny, as the family called her, because of her diminutive stature, cared for him until their father married Mary Maddox, April 28, 1852. Jimmy, as he was called, was not yet four years old when his new mother came into the home. Aunt Tiny, whose married name was Hannah Caroline Hieks, told us later that Jimmy was so little and cute and pretty, she almost wished he would never grow up. She told us she almost got her wish, for he was a small man, only five foot five inches tall, and weighed 125 pounds in young manhood, and only 115 in old age. He was a handsome man with brownish green eyes and black wavy hair. Jimmy was always proud of his ancestry, the coveted "Old Virginia stock." He was Scots-Irish and his father came from North Carolina and pioneered in western Tennessee. 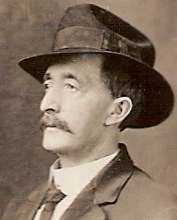 Jimmy's father, Hugh Carnes Henderson, reared a large family by his three wives: Elizabeth, Lucretia Taylor, and Mary Maddox. Public schools were very poor in the south after the war. Hugh was determined to provide his children with facilities for schooling, so he hired the best teacher he could find to give his children private lessons at home. Jimmy was a good penman and when he grew up, he gave lessons in penmanship. He was a religious, prayerful person, a member of the Methodist Church. Jimmy spent his young manhood working on his father's plantation while his older brothers were away in the Army. His father, Hugh, was shot by Yankee soldiers while standing at his own front door. Jimmy was so sad and depressed, he immediately volunteered for Army service and urged the draft board to let him go. He was anxious to avenge the death of his father. He was only sixteen years old and too small, so he was rejected. After the war was over, and his brothers came home, his step-mother divided the property, giving each child his share to get started in life. The slaves did not want to leave after they were given their freedom, so they stayed on the plantation and did the work until the boys were old enough to care for the farm. Jimmy said he had trouble getting along with his step-mother and it seemed natural, because his older sister had humored and spoiled him. He said his father, Hugh Carnes Henderson, was the kindest man he ever knew. Hugh was a very successful man--a farmer and builder. He helped build the country roads, levees, and bridges, and the first railroad across the State of Tennessee to the Mississippi River. Jimmy was too young to receive his inheritance. He did not know how to manage it. He spent it having a good time. He dressed well and mingled in high society. He often remarked that he danced with the Governor's daughter—a rare privilege for one out of her circle. He was charitable and too generous with his money. He had but little to start making a home when he decided to marry and settle down. Jimmy and Annie Caroline Smith, were married by Reverend Taylor, of the Baptist Church, May 24, 1885, at Jackson, Madison, Tennessee. They had a quiet wedding at high noon in her grandmother's home, with a reception in the afternoon. Jimmy bought thirty acres of land near Jackson and his mother's brother, a wealthy man, Uncle Wyatt Taylor, gave him fifty acres adjacent. This made a good-sized farm where they reared their family until the older children were ready for high school and they moved us into Jackson. Father was not able to manage the farm alone. Although he only received a little from the farm, he did not sell it until they moved to Utah in 1911. In 2001, I made a trip to Nashville, Tennessee to visit Joan Walker, one of my songwriting co-writers. I made a side-trip to Jackson where I met my only surviving cousin, Claudia Henderson Riding and her family. They showed me the area of the Henderson farm, and we visited the Taylor cemetery where many of the family are interred. I didn't know anything about southern hospitality until that visit. It was a complete delight. Again in 2004, I drove through Jackson for a short visit and picture-taking. What a beautiful country. It must have been hard for the family to leave, though the desert has its own beauty. Annie Caroline Smith was born November 21, 1861, in Chunchula, a suburb of Mobile, Mobile County, Alabama. Annie Caroline was the only girl. Her two brothers died in childhood. She had much to do in the home and garden to help her grandmother and invalid mother. During the Civil War, they only had a meager living. Her father, William Henry Smith, born January 7, 1839, was in the Army, and when fighting ceased, he did not return when the other soldiers came wearily walking home. It was rumored that he died of small pox, which was prevalent in the prison where he was last known to be kept. No one remembers where he was born or where he died. That's so sad to me. We are traditionally informed that he fought in the "Battle of Atlanta," which is described in "Gone with the Wind." Annie's mother, Civilla Ann Magee Smith, born January 7, 1839 in Chunchula, Mobile County, Alabama, was an invalid because lightning struck a tree near the porch where she was standing. She died about forty years of age, leaving her daughter in the care of her mother, Mary Lyle Miller Magee, born August 3, 1804. Her Grandfather was John Magee born about 1800 in Mobile, Alabama. Carrie, as Annie Caroline was called, was a steady, patient person, kind, slow to anger, but firm. She was a very pretty girl with black hair and blue eyes. Our father told us he loved to take our mother to fashionable places to watch people admire her. Mother, like our father, was very religious, a studious Bible reader, a member of the Baptist Church. After they were married, father joined the Baptist Church, because he said he thought it was better for the children if both father and mother belonged to the same church. He loved the spirit of the home to be congenial and happy and he tried to prevent arguments and contention among us. Jimmy did not like the name Carrie, so he called his wife Callie—the name by which she was ever afterwards known. There were only a few public schools after the destruction of war was fought on our soil. Mother had very little chance to go to school, but she must have made the best use of the time she spent studying. She was a good reader and speller. We asked her how she learned to speak English so well, and how she acquired a fine vocabulary. She said by listening carefully to educated people. Father and mother were both anxious for us to obtain sufficient schooling to mix in society. They were devoted parents—truthful and honest and always set good examples for us children. When mother requested we do something for her or father, we knew we had to do it. She would not give up until the task was complete. She seldom punished us, but would do so firmly if necessary, for she was a good disciplinarian. Father was quick to anger and quick to forgive and very kind to all, especially us children. He would say, "Callie, I can't punish that child." So Callie, being the disciplinarian, would have to talk us into obeying father. Her English blood urged her to believe that children must obey to the letter, while father, being a Scot, was more lenient. In the Spring of 1898, LDS missionaries, William Karren and Charles McNeil, both of Logan, Utah, visited our home. Daddy was working in the garden near our house when the Elders approached. They explained who they were and my father said, "I believe you are Mormons, followers of Brigham Young, aren't you." They answered, "Yes." He said he was not interested because he could not take care of one wife as well as he should. They left three tracts and said they would be back in a week or two to see what Father thought of them. This was the beginning of the conversion of the James Wesley Henderson family to Mormonism. Father brought the pamphlets in the house and jokingly said, "Let's begin studying Mormon doctrine." That evening while we children were doing our lessons, our parents read the pamphlets. I shall never forget the expression on mother's face after she finished reading the booklets. She said, "I have been looking for this doctrine all my life. I thought the Baptist Church was nearest like the church Christ established, but it is not founded on Prophets and Apostles." Mother, Annie Caroline Smith,Callie, was the first to accept the gospel, but was not baptized for three years after she was converted. Mother waited for father to accept. He urged her to be baptized, for he could not be satisfied with all the ideas the Elders taught, like work for the dead, pre-mortal life, and marriage for eternity. We all eventually came to an understanding one or two at a time. Our home in Jackson was always open to the LDS missionaries. For a long period of time, Father kept a record of the elders who had stayed in our home. The number exceeded two hundred who had received meals, laundry done, and been nursed when they were sick, even to staying up all night during their illnesses. He grew tired of keeping the list, so we have never known an accurate number our parents cared for from 1898 until 1913 when Father and Mother left Jackson to establish their home in Salt Lake City, Utah. James and Callie were faithful Latter-Day-Saints as long as they lived. They returned to Jackson in March 1917 to gather some genealogical records. Father went along to town the 12th of April, 1917. He had a stroke and fell to the ground. He was pronounced dead a few minutes later. His funeral was conducted by the missionaries of the district and was well attended by friends and relatives. Mother was very happy to see so many who had been very bitter and abusive when they accepted Mormonism, come to her and show tenderness and compassion. Burial was in the family cemetery. Only my brother, Woodard was able to attend the funeral. 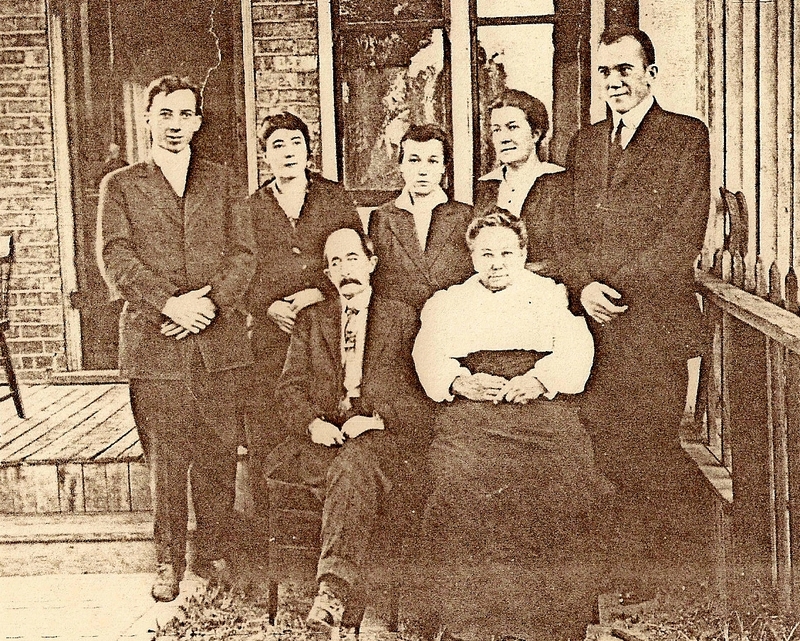 Mother returned to Salt Lake City and lived with Woodard for a time. She then lived with my brother Walter until her death of influenza and pneumonia, January 29, 1919. She's buried in the Salt Lake Cemetery. They were the parents of six children—Sivilla H. Jones, Tisha Lucretia, who died in infancy, James Woodard, Walter Sidney, Naomi Dove Lewis, and Margaret Fisher. Father had two full brothers, William Taylor Henderson, and Mark Carnes Henderson, and eight half brothers and sisters. Mother had two brothers who died in childhood. My parents remained true to the gospel until the end of their lives. They were full tithe payers and observers of the word of wisdom. They were especially active in gathering genealogy. It was true, the hearts of the children had been turned to their fathers. 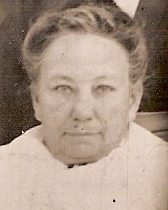 I am Sivilla Anne, born August 25, 1886, in Jackson, Madison County, Tennessee, the oldest daughter and child. I have written a small part of the lives of my parents.